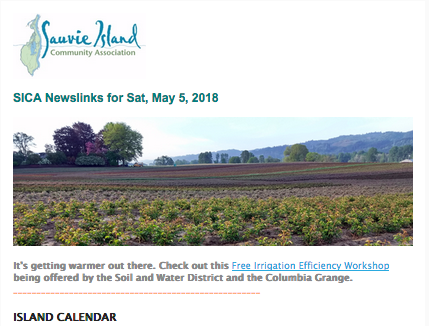 Submitting this form will add you to the Sauvie Island Community Association (SICA) email distribution list that includes an enewsletter called Newslinks, in addition to time-sensitive information or alerts for our local audience. We rely on community input. Email your news, photos and island story ideas to communityassociation@sauvieisland.org. Because this information is for our local Sauvie Island community, we require that you provide the information below to verify you are an island resident, property owner or business owner, or a resident of a marina and moorage along Multnomah Channel (within Multnomah County). Others with a connection to the island may receive Newslinks, but would not be eligible to be members of SICA. We will not share this list with any other organization.